This article describes the methodologies and outcomes of a digital imaging project implemented at the University of Miami that analyzes and documents the historical architecture of Coral Gables, Florida. The project consists of the integration of traditional and innovative approaches to art-historical research in an activated learning environment where students determined the project’s content. 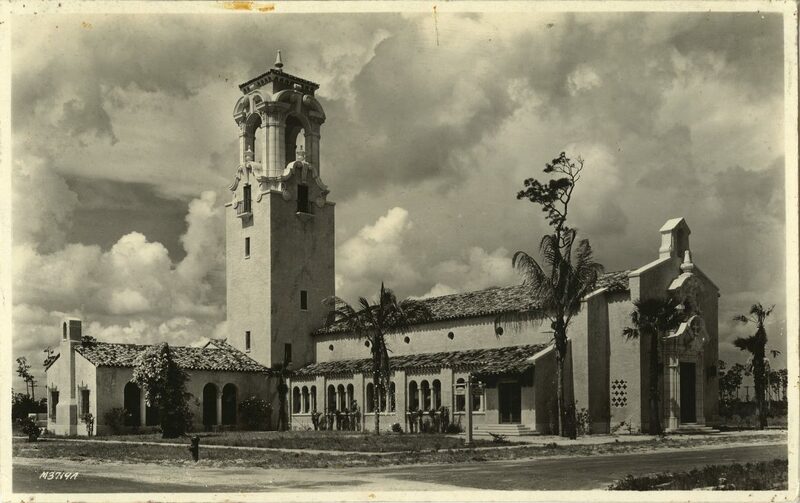 Students in small groups gathered visual and documentary materials to create comprehensive dossiers for eight historical buildings in Coral Gables, structures that were built in a distinctive Mediterranean style at the time of the city’s foundation in the 1920s. Complementing the art-historical data collected are 3D models created using photogrammetry that can be viewed and manipulated on an interactive website in conjunction with the comprehensive materials collected about each structure. This project emphasizes collaboration and interdisciplinarity in the novel application of computational methods to address questions and issues within the realm of visual culture. It highlights the importance of students as active participants in the conceptualization and implementation of the project’s goals. It has also been highly successful in creating bridges between the university and the community around it, promoting awareness of cultural heritage sites and their preservation through the use of a set of advanced and innovative art-historical tools. This 3D modeling project of historic architecture in Coral Gables, Florida began as a module in a lower-level course on Spanish art taught at the University of Miami. The course material addressed the impact of Spanish architectural styles on the artistic production of Spain’s colonial possessions. 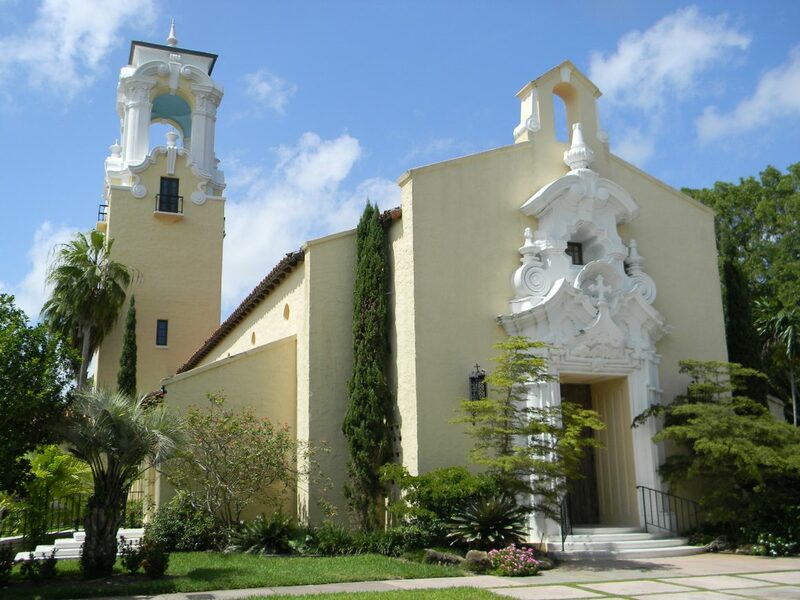 The Spanish heritage of “La Florida,” a possession of Spain from 1513–1763 and again in 1783–1819, is evident in numerous colonial and colonial style structures, and the city of Coral Gables, where the university is located, presents particularly good examples of this type of architecture. 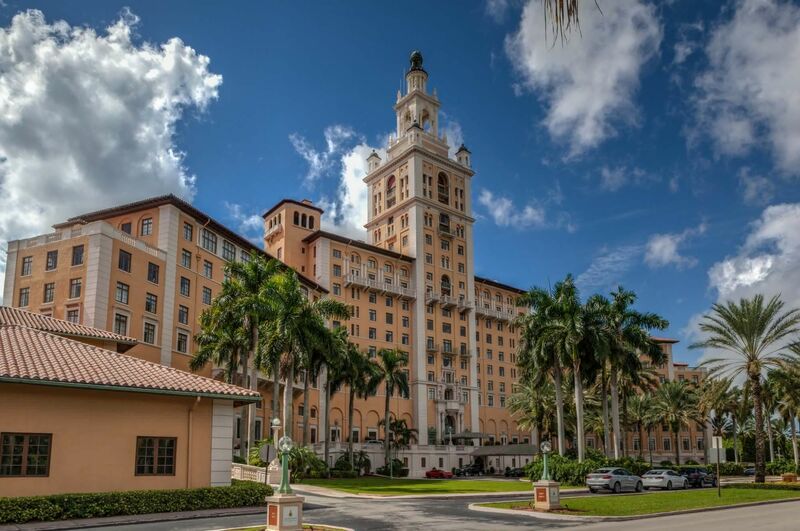 Coral Gables was founded by George Merrick in 1925 with the vision of recreating “Castles in Spain” in its architectural style. The earliest structures in the city consist of an eclectic mix of Spanish, Spanish colonial, and Italian cultural references through which Merrick and his architects created a distinctive Mediterranean ambience in the city. Coral Gables, then, presents the ideal visual laboratory to study the influence of historical European architecture on early twentieth-century urban planning in the United States. What began as a classroom experiment in the use of new imaging technologies to visualize architectural structures has developed over the past two years into a full-fledged research project. This study of historic Coral Gables architecture now consists of eight monuments: three structures that are addressed in detail below (The Congregational Church of Christ, the Church of the Little Flower, and the Biltmore Hotel) as well as the Coco Plum Woman’s Club, the Colonnade Hotel, the Fink Studio, the Douglas Entrance, and the Coral Gables Preparatory Academy. 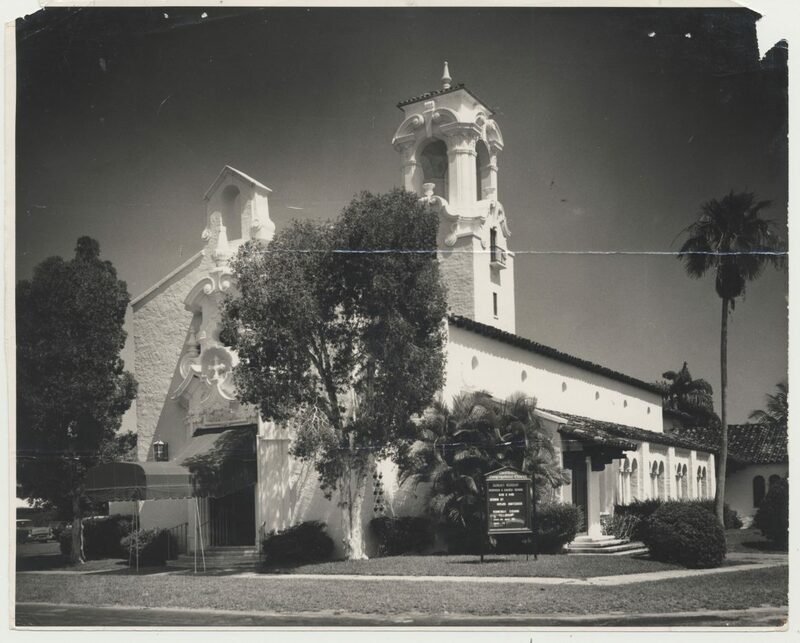 Their documentation is recorded on an interactive website that includes textual and visual resources, historical and contemporary photographs and visualizations of the structures employing new technologies [http://historiccoralgables.ccs.miami.edu]. The website aims to be a compendium of knowledge about these buildings, searchable from a variety of perspectives that can provide information for a broad spectrum of users and viewers—the general public, tourists, city officials and administrators, academics, students, and historic preservation professionals. The project has been defined from the outset as an ongoing one given its broad scope, and additional data will be incorporated as part of successful grant applications. The article’s authors are the project team. Dr. Mathews was responsible for generating the website’s content, historical documentation, and standard digital photography. Mr. Mader and Dr. Sarafraz conducted the drone photography and digital photography and processed the data for the creation of the point clouds. Students were responsible for digital photography and art-historical research as well as the creation of the audio tour for the eight historical monuments. An initial version of the website provides general information on George Merrick’s vision for Coral Gables and the artistic and intellectual influences that inspired the city’s unique style. 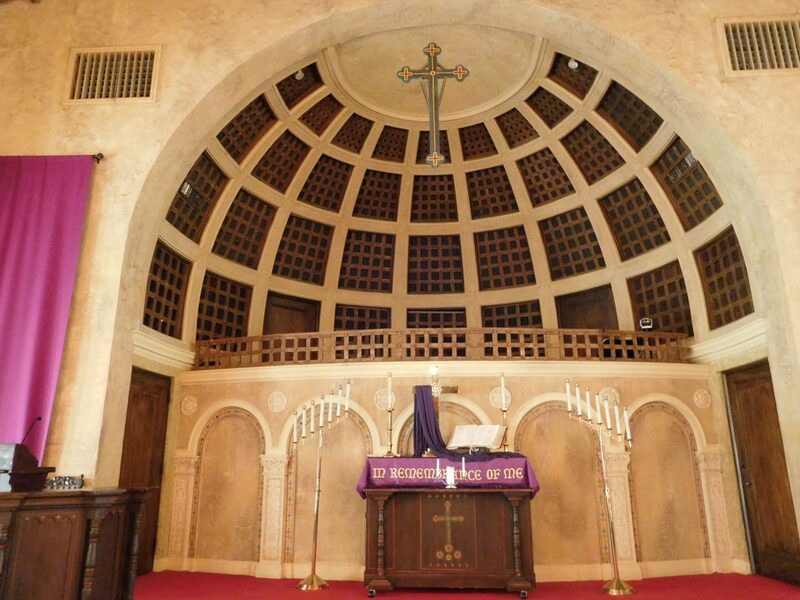 It currently focuses on one monument, the Congregational Church of Christ, as an example of the type of content to be incorporated into the interactive site. The authors will continue working on the project and will collaborate with groups or individual students on its research and implementation during the coming years. We envision that in future art history classes, students will gain expertise in creating 3D models, employing photogrammetry to formulate models of small-scale artworks within the structures themselves. The same approach to modeling space can be applied to modeling objects, and the students will collect data and refine 3D models on a micro scale using modeling software available at the university. 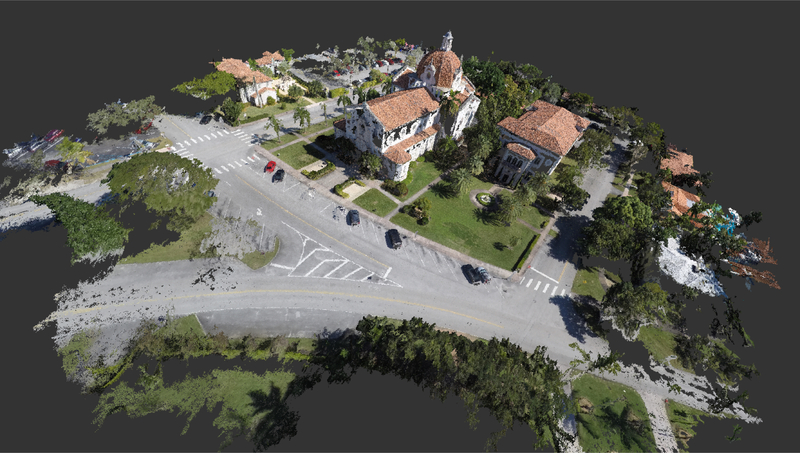 The digital imaging project for the early Mediterranean style structures in Coral Gables consists of three interconnected parts: art-historical research dossiers, 3-D models, and an interactive website. 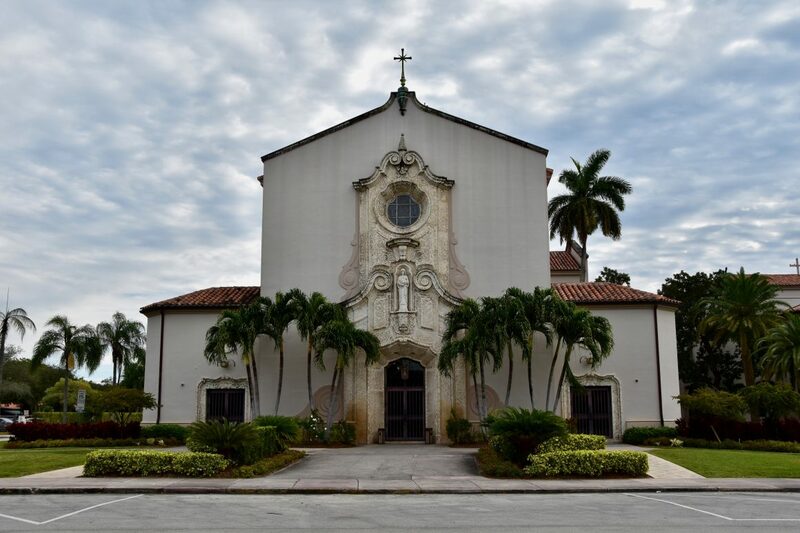 In the context of the Spanish art course, students conducted photographic surveys and art-historical research for three 1920s buildings in the city: The Church of the Little Flower, the Congregational Church of Christ, and the Biltmore Hotel (Figures 1–3). The photographs serve as documentation of the structures’ state of preservation as of 2016, almost one hundred years after the buildings were constructed. Combined with the thousands of photographs taken to construct 3D models using photogrammetry (a technique that will be described in detail below), the photographic campaign resulted in the creation of a comprehensive digital archive for each structure. Students consulted the extensive resources available on early Coral Gables history in the Special Collections Department of the University of Miami’s Richter Library in order to create detailed art-historical dossiers that chronicled each structure’s history and analyzed the visual elements that connected the buildings to Mediterranean structures across Europe. The contemporary photos can be juxtaposed with historical ones, documenting the evolution of these structures for almost a century (Figures 4 and 5). The overarching goal of this project is the combination of traditional art-historical methodologies with innovative digital imaging technologies to bring these buildings to life. The images and documents gathered by students will be presented in a web-based interactive map of the city of Coral Gables. From the map, users/viewers can select a particular structure and navigate to a page that presents comprehensive information about that specific building. The website will display both modern and historical photographs of the monument, and provide access to documentation related to the building’s construction, preservation, and history. These documents include newspaper articles, advertisement campaigns, designation reports, plans, elevations, and architectural drawings. It will also incorporate in-depth art-historical information about the structure and its relationship to historical architecture of the Mediterranean region to trace the cultural origins of the references that were so inspirational for Merrick and his architects. Complementing the digital photographs will be 3D animated models created through the use of photogrammetry techniques and modeling software. Visitors to the website can select a specific monument and gain access to a wealth of information on that building, including visual and textual materials from the 1920s to the present day. The data presented on the site is comprehensive, but can be experienced from various perspectives depending upon the interest of the viewer. Funding has been provided by the Coral Gables Community Foundation and a City of Coral Gables Cultural Development Grant to document five additional structures, bringing the total to eight public buildings created in the first decade of the city’s existence. The website will be actively curated to incorporate crowdsourced photographs and audio files that document personal experiences related to each historic structure. The participatory aspect of the site helps highlight the living nature of these buildings and the role that they play in the Coral Gables community today. Crowdsourced and publicly available photographs also have the potential to serve as an extraordinary research tool; if sufficient images can be gathered from a particular time period, it is then possible to create a 3D model to document the appearance of the building in the past as a comparison to its current state of preservation. To complement the data provided on the website, students from the University of Miami’s Computer Science course “Introduction to Software Engineering” have created an Android application for a virtual tour of these Coral Gables monuments (available for download on the Google Play Store). The app allows the user to select a specific monument and then view photographs of the structure, read historical background about the building, and listen to audio files addressing different elements of the building. The use of an application on a smart device essentially activates and mobilizes the website content. Users can access the content to enrich their experience when they visit the historic building itself or they can take a virtual visit. This technology embraces two broad categories of practice: qualitative and evaluative. In the first, classical category, quantitative measurements are used to compute ground positions and elevations, distances, areas, or volumes. The output of conventional photogrammetry is typically a map, drawing, or a 3D model of some real-world object or scene. The second evaluative category involves the evaluation and interpretation of photographs for practical applications in such fields as topographic mapping, architecture, engineering, archaeology, manufacturing, quality control, police traffic crash and crime scene investigations and geology, and meteorology. Modern photogrammetry overlaps extensively with Computer Vision (CV) and employs systems that acquire data through non-conventional photographic systems, for example, radar imaging, x-ray imaging, LIDAR, etc. One particular CV concept that has become very popular and accessible over the past ten years is called Structure from Motion (SfM). SfM is an approach for recreating a 3D scene from a set of 2D photographs. SfM is not an individual algorithm, but instead relies on the application of a pipeline of CV methods to produce results. As such, this approach is highly flexible and offers customized options to suit individualized and specific needs. This flexibility has brought about a rapid expansion in both open source and commercial implementations of the pipeline. The output of SfM is an unscaled (generally) 3D model called a “point cloud” (Figure 6). Once the point cloud is created, software tools that were developed initially for processing LIDAR data can be used to construct a fully textured 3D model. Point clouds produced by SfM are by themselves compelling and useful tools for viewing and interacting with art-historical objects and architecture. Point clouds can also be processed into derivative digital products, of which the two most common are: 1) orthoprojected imagery (Figure 7); and 2) fully textured 3D models. Unlike a perspectival photograph, an orthophoto has been geometrically corrected for image displacements caused by the tilting of the camera and terrain relief (topography). 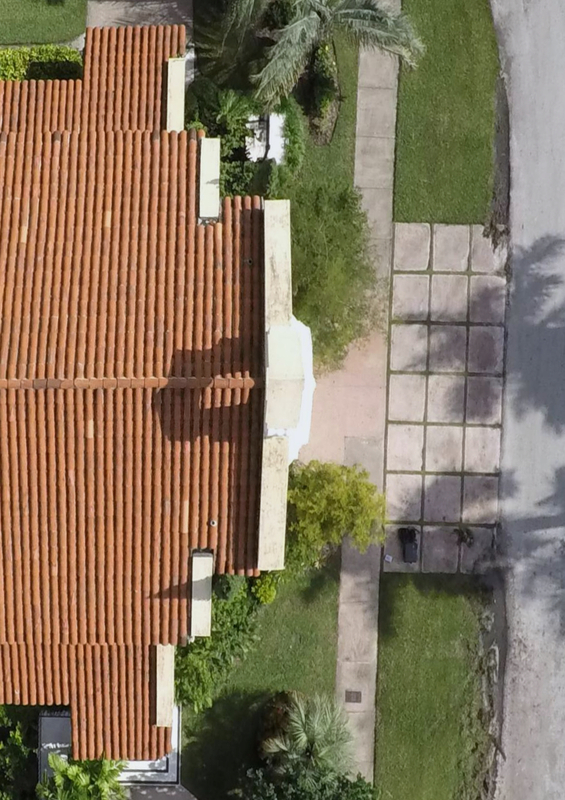 In an orthophoto, the perspective effect has been removed, resulting in a photograph with a uniform scale. It can thus be utilized in the same manner as a map to measure distances and angles between the features within the photograph. Orthophotos can often be created automatically as an extension of the SfM pipeline, and are easily scaled if physical measurements have been made of the physical context. A classic application of orthophotos is the creation of scaled drawings and maps. Like orthophotos, fully textured 3D models can be created from point clouds automatically, but the quality still needs to be improved and refined through the use of modeling software tools (Figures 8 and 9). We also utilized small, unmanned aircraft systems (sUAS) in conjunction with the photogrammetry. These small “drones” are mounted with an inexpensive camera (e.g., GoPro) and used to capture both aerial photos and photos of hard-to-reach elements of buildings or other large structures (Figure 10). During the past two to three years, these systems have become highly reliable and relatively inexpensive, with a combined cost (generally) less than $1,500 for the system, camera, spare parts, and other incidental equipment (e.g., carrying case). When used with the photogrammetry methods described above, high-resolution composite aerial photos (orthophotos) can be produced for an architectural site. Since these photos are captured at low altitude, they have much higher resolution than typical satellite imagery or traditional aerial photography. Pointclouds can be created for entire structures or can focus on individual, difficult-to-reach elements like a gargoyle, bell tower, or dome lantern (Figure 11). There is great potential for the application of photogrammetry in the study of historic monuments given its low cost, high resolution, and great flexibility for employing the imagery generated. The use of (sUAS) or drones allows for a comprehensive photographic campaign that can provide images of architectural elements that are hard to reach or virtually impossible to view. Easily and inexpensively captured, the photographs can be used to create a complex point cloud and serve as a valuable documentary archive. The images are thus important documents unto themselves, but once meshed to form the point cloud, they can be deployed in a variety of different applications to provide significant information about a structure. The orthophoto produced from such images provides a view of the building that cannot be experienced from the ground. The orthophoto is also highly accurate, and can be used in historic preservation campaigns to provide the detailed documentation required to meet governmental standards [https://www.nps.gov/HDP/habs/index.htm]. The 3D nature of the point cloud and its interactive capability make it well suited to open source platforms like Sketchfab that enable the viewer to manipulate images to better understand and experience the modeled space. Point clouds can be created for both interior and exterior spaces and, in situations where LIDAR is prohibitively expensive or impractical, photogrammetric techniques can render all aspects of an architectural monument—interior, exterior, general, and detailed views—in an accurate but also visually compelling manner. The 3D models can also be re-rendered in physical form with 3D printers. The buildings can thus be recreated physically for study, research, and community education and outreach, providing an additional format for the viewer to explore the space, form, and details of the structure. Our experience has shown that photogrammetric techniques provide a valuable addition to the art-historical documentation toolbox. One challenge posed by this technique, however, is that it requires a new way of thinking about taking photos—for photogrammetric techniques to be effective, there must be sufficiently redundant coverage of a structure for SfM to work well. Though the actual acquisition of the images is rapid, several hundred overlapping photos may be needed to create a satisfactory point cloud (probably a twenty-minute process) rather than the dozens one might have taken previously. Since this method can produce scaled models and images (orthophotos), it can be particularly useful in cases where time on site is limited. Under such circumstances, a sufficient number of both aerial and ground-based photos can often be obtained within a single day (depending on the size of the site) to create detailed models and site plans. These digital resources can then be used off-site to aid in creating or finalizing sketches and other types of documentation made on-site. Photos and other digital objects can also be reused when new methods become available or combined with new data collected in subsequent campaigns. Other imaging systems like LIDAR, for example, may be a better option for capturing data where there is insufficient light or large interior areas to be modeled. The main disadvantage of LIDAR, however, is the cost of the system itself. The equipment can be quite expensive while SfM provides the opportunity to capture data about architectural structures and make high-quality 3D models at a much lower cost. This approach does not require special cameras, and for small datasets, there are numerous open source and commercial options available to process the imagery. As an example, a point cloud and orthophoto for the Church of the Little Flower (Figure 6) was created using an inexpensive drone and a GoPro camera. 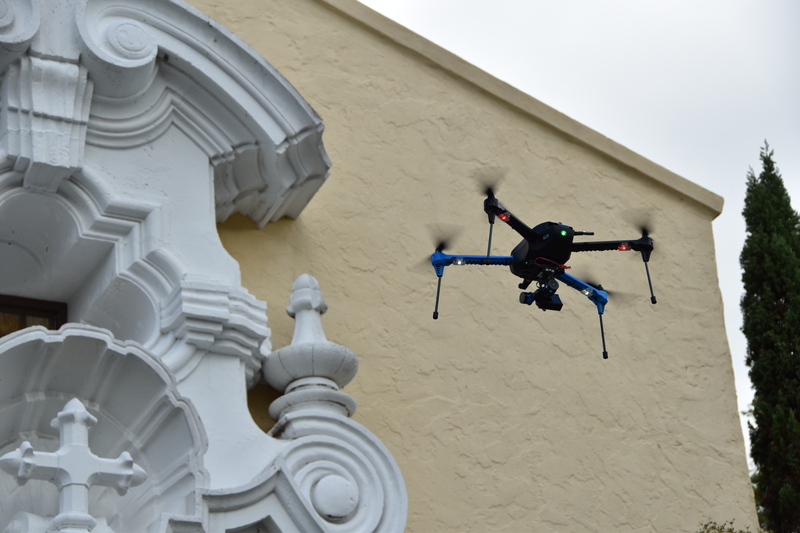 The drone (3D robotics IRIS+) was programmed to fly a survey pattern that spanned the church and a small part of the surrounding area. This aerial survey produced several hundred overhead photographs from different perspectives. We then applied a set of CV algorithms to correct lens distortion and otherwise prepare the images for an SfM pipeline (research that will be addressed in another publication). The SfM pipeline was then run to produce the point cloud and orthophoto. We worked with open source systems including Bundler, VisualSfM and OpenDroneMap, and experimented with several commercial offerings. SfM pipeline development is a highly active area of research for both academic and commercial organizations, with available options changing frequently. We regularly review the current state of the field and often apply multiple pipelines on projects to evaluate performance and new features. As new photographic methods for creating and processing 3D images develop, we believe that the application of these techniques and use of the resultant products will become standard elements in art-historical documentation, preservation, and interpretation. The use of 3D modeling techniques to create rich interactive and immersive built environments has far-reaching implications for art-historical pedagogy and research as well as community-based historical preservation. The project outlined above employs activated learning and the flipped classroom models in defining the role played by students. The students actively engaged in the collection of data by photographically documenting the historical buildings while conducting research on other structures (those that have not been the object of in-depth study). Thus, the students were instrumental in determining the project’s content, populating the website with data that includes text, primary documents, historical and contemporary photographs, ephemera (e.g., postcards, brochures, advertising posters, newspaper articles), audio files, and a detailed bibliography. The class conducted fundamental art-historical research that has the added benefit of being accessible to the public through an interactive website. In future iterations of this classroom project, students will gain even more hands-on experience with photogrammetry as they themselves conduct the photographic survey to create interior 3D models from point clouds. They will also create models of decorative and small-scale objects within the structures, using photogrammetry on a micro scale to complement the larger-scale architectural implementation. In this way, the students will be involved in every step of the project—gathering data, creating a point cloud, and refining a model for display and study. 3D modeling techniques also allow for a compelling and immersive experience of architectural structures in the classroom. An extremely challenging aspect of teaching architectural history is the attempt to configure and analyze a 3D space with 2D media. In studying an architectural structure, one generally shows several different interior and exterior views, fragmenting the space into constituent parts that never quite add up to a whole. A 3D model of a building, however, allows viewers to experience a structure holistically, to understand how parts relate to the whole, and to get a real sense of what it means to occupy that space. Advancements in AR, MR, and VR (augmented, mixed, and virtual reality) further enhance these experiences, and the goal of this project is to make the modeled environment deeply engaging and rich in color, texture, and detail. In the classroom space, students can travel to places they have never seen, visiting monuments in distant locations or experiencing reconstructions of lost structures. Employing these new approaches to understand and experience architectural space could also encourage students from other disciplines to take courses in art history. Innovative technologies, then, could serve as the “hook” that introduces students to a completely different field of study, expanding the purview of art history and promoting more cross-disciplinary interaction on campus. This modeling project also deepens the interaction of the students with the community by establishing an urban classroom. Students bring the classroom to the city by conducting research on the monuments themselves, implementing the skills of the discipline in a new environment. The interaction with and analysis of the completed interactive models furthers this connection in the opposite direction, incorporating the city into the classroom. As a result of this bi-directional movement, students may appreciate the differences in their perception of the architectural space as they alternate between real and virtual viewing modes. Finally, introducing students to new imaging technologies teaches them skills that will be essential for their success in the professional world of art history, either in an academic or museum setting. Digital visualization provides the promise of universal access to international art treasures, and young professionals need to be familiar with imaging techniques and tools that can be used in teaching, in the creation of virtual museums and immersive exhibitions, and in the preservation of historical monuments. Knowledge of new technologies will also encourage experimentation and collaboration so that they themselves can create innovative applications for imaging techniques. For example, in this project, the computer science students working on the virtual tour app gained knowledge about art-historical practice and cultural heritage, while the art history students learned about new digital imaging technologies. This cross-disciplinary approach will lead to further collaborations and the sharing of knowledge and expertise between students at the University of Miami that they can implement when they enter the professional world. The incorporation of technology into the art history classroom exemplified by this 3D modeling project provides tangible learning outcomes that are practical, intellectual, and theoretical. Students actively participate in the generation of knowledge, and they gain important skills to advance professional training in art history related fields. This project promotes community engagement by raising awareness of cultural issues that challenge us now and will continue to do so in the future. For example, how do communities balance an interest in historic preservation with urban development? How can cities and their inhabitants be informed and empowered concerning the safeguarding of civic structures and what role can technology play in addressing these questions? The introduction to new technologies can serve as a springboard for students to apply their skills in novel ways and can attract new students to art history. Interactive 3D models visualize space in an innovative fashion and therefore raise questions about the efficacy and implications of new visual forms. They broaden the art-historical toolkit, fostering debate about their interpretive potential. They also offer the promise of revolutionizing the field with a working method that highlights collaboration, innovation, and interdisciplinarity. The use of digital technologies in art-historical studies also has a profound effect on the research process and its published results. Art-historical research is usually a solitary affair, where an individual researcher devises a project, its methodology, and goals. However, the mastery of advanced imaging techniques—photogrammetry, LIDAR, 3D modeling software—requires the expertise of scholars both within and outside art history. The creation of immersive and interactive built environments, then, is a collaborative project that brings together experts in software engineering, computer vision, historic preservation, and architectural history. Such interdisciplinary projects are inherently creative as new technologies and knowledge are brought to bear on traditional questions and problems, with a result that is often greater than the sum of its parts. The use of technology can and does encourage the posing of new questions about visual culture and can only enrich the field with all the possibilities that exist to enhance the experience of visual imagery and 3D spaces. Technological advances will also change the dissemination of knowledge and pose great challenges to the manner with which the academy assesses scholarly output. Academic presses are only beginning to publish monographs in an interactive digital format [http://www.sup.org/digital/] in which a web-based interface allows readers to consult a scholarly publication while simultaneously interacting with visual materials that can be manipulated, zooming in and out of images, rotating 3D models, and entering immersive built environments. Readers/viewers thus have extraordinary autonomy to determine how they wish to navigate the publication—reading only the text, concentrating on the visual imagery, or defining their own path that integrates the two components in an individualized and non-linear way. The potential of web-based scholarship is extraordinary, but the academy needs to be open to expanding what it deems original scholarly work, particularly when scholarly publications are such an essential part of the tenure and promotion process. Ultimately, architectural structures are grounded in a community, and the study of historical monuments in Coral Gables encourages collaborations that connect the city to the university that is located within its confines. Students have the opportunity to participate in community outreach, see the impact that these buildings have in an urban setting, and experience the importance of their research for cultural development and historical preservation. The partnership between communities and academic institutions in cultural patrimony and preservation is a potentially fruitful one as academic innovators can apply their research methods and advanced technologies to real-world situations outside the university. Municipalities are often challenged by lack of funding for cultural development and historical preservation, and projects like the one outlined above for Coral Gables can be instrumental in enhancing public knowledge about historical buildings and supporting cultural heritage initiatives. The technologies and methodologies developed here to study historical monuments in Coral Gables can be assembled easily into a toolkit of sorts, applicable to the study of historical architecture in other locales. 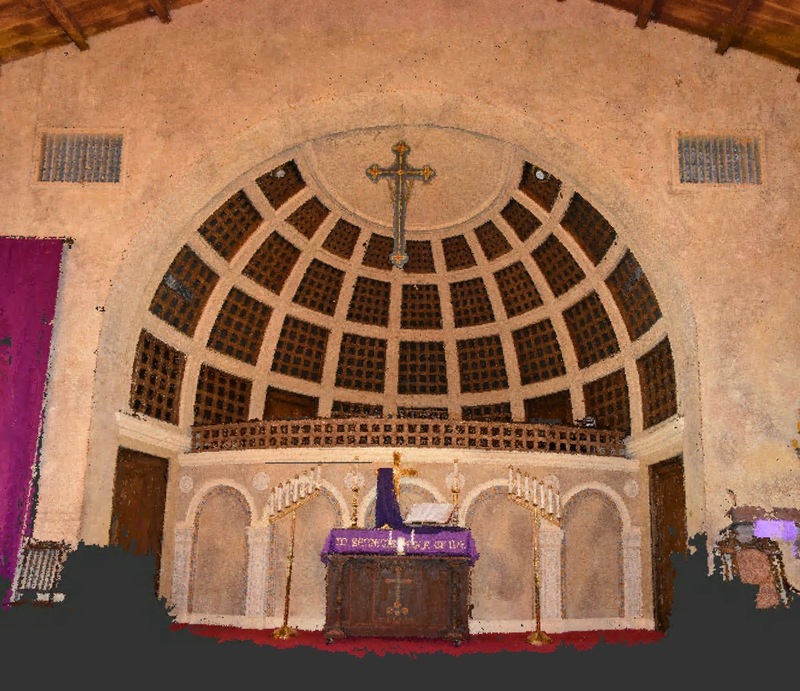 Beyond the immediate context of Mediterranean style architecture in the city of Coral Gables, these digital imaging approaches, with their relatively low cost, high quality versatile images, and applicability for a variety of platforms and formats, offer the opportunity for other cities to highlight and promote their own rich cultural heritage and preserve it for the future. In his 1935 essay “The Work of Art in the Age of Mechanical Reproduction,” Walter Benjamin famously noted “that which withers in the age of mechanical reproduction is the aura of the work of art” (Benjamin  1968, 221). An element of Benjamin’s “aura” would be the multisensory experience of an architectural space, its tactile and olfactory elements and acoustic qualities, all absent in a 3D model that highlights the visual. However, a significant difference between a standard photographic reproduction of a building and an interactive model is the model’s incorporation of an essential spatial dimension that reintroduces the element of time. Modeled architectural spaces have the potential to deepen our understanding of the built environment, especially when they are used in tandem with the actual structures themselves. Students can visit the historical building and its reproduction, analyzing the differences inherent in the real and virtual space and considering what advantages and disadvantages each mode of presentation poses. The advent of photography and film occasioned great anxiety concerning the efficacy and implications of mechanical reproduction, but Benjamin was not universally negative about the profound effects of new media on the perception and understanding of artworks. In fact, with the loss of aura that resulted from the emancipation of art from ritual came increased public access to art and therefore greater participation in the construction of meaning (Benjamin  1968, 220–21, 224–25). Benjamin appreciated the revolutionary potential of technology and the application of these new visual tools holds similar promise. What is gained and lost by experiencing a structure virtually, and how can that experience be enhanced? Such questions could form the basis of instructive class discussions as the visual simulacra we produce in our contemporary society become increasingly sophisticated and tantalizing. Unless the teaching environment is at a museum or monument, most art-historical study is conducted through reproductions. Our reliance on simulacra, then, invites us to consider how more complex and visually compelling images can change the way that we practice the discipline and approach the essential tools for the study of art and architecture. We may indeed lose the aura of the object, but what we gain is the facility and immediacy of access to places we might never have the chance to visit and experience firsthand. Thus, the use of photogrammetry techniques and modeling software tools provides an innovative approach to the study of architecture in a university setting. These techniques are highly effective with great potential for development and improvement. They form part of a growing body of digital documentation for art history and the humanities that will become standard in the next few years as they provide unparalleled documentation as well as instructional and interpretive tools for visual and material culture. Experimenting with these techniques now will help refine and improve them so they can play an even greater role in the study of architecture for research, teaching, and historical preservation in the future. Technology, however, is just one component in these forward-looking art-historical practices that emphasize collaboration, interdisciplinarity, activated learning, and community interaction. Digital imaging technologies hold extraordinary potential to revolutionize the way we study, interpret, and interact with the built environment in both physical and virtual modes. See the works by Parks (2006; 2015) cataloguing the early history of the city and its distinctive Mediterranean architectural style. See also the City of Coral Gables website for a brief overview of the city’s history. The documentation of these five structures is currently ongoing. The University of Miami Center for Computational Science will be hosting the project website and is committed to ongoing hosting of the project as an aspect of its Smart Cities Program. For the use of crowdsourced photos to create 3D models, see Frahm, Heinly, Zheng, Dunn, Georgel, and Pollefeys (2013). Snavely, Seitz, and Szeliski (2006) provide an early interesting example of the potential for this concept. See also the discussion below about the creation and application of point clouds. http://www.cs.cornell.edu/~snavely/bundler/ is one of the earliest and most influential examples of these recent (i.e. the past ten years) implementations of SfM. There is an increasingly large body of projects undertaken over the past five years or so that employs point clouds to reconstruct historical monuments, archaeological sites, and 3D sculpture, but this technique has yet to be integrated into the mainstream of art-historical imaging practices. For some representative projects, see: http://danigayo.info/teaching/ticharte/; http://news.nationalgeographic.com/2015/06/150622-andrew-tallon-notre-dame-cathedral-laser-scan-art-history-medieval-gothic/. The National Park Service has created a set of 3D models for Ellis Island; see https://www.nps.gov/hdp/exhibits/ellis/Ellis_Index.html. The point clouds themselves have been recognized as having their own artistic merit; a book entitled The Art of the Point Cloud (forthcoming in late 2017) will feature reproductions of “the most beautiful point clouds”; see http://www.spar3d.com/news/lidar/book-wants-beautiful-point-clouds/. Data collected through photogrammetry and LIDAR can be combined: once the data is integrated into a point cloud, the means through which it was generated is not particularly significant. The two sets can be brought together either manually (with a tool like Autocad) or computationally; see the open source project “Point cloud library” that outlines this process <http://pointclouds.org/documentation/tutorials/registration_api.php>. For some examples of immersive historical environments, see Hogarty and Ferguson (2014) and Sierra, De Prado, Ruiz Soler, and Codina (2017). Benjamin, Walter. (1935) 1968. “The Work of Art in the Age of Mechanical Reproduction.” In Illuminations: Essays and Reflections, edited by Hannah Arendt, translated by Harry Zohn, 217–51. New York: Schocken. Frahm, Jan-Michael, Jared Heinly, Enliang Zheng, Enrique Dunn, Pierre Georgel, and Marc Pollefeys. 2013. “Geo-registered 3D Models from Crowdsourced Image Collections.” Geo-spatial Information Science 16, no. 1: 55–60. https://www.cs.unc.edu/~jheinly/publications/geo2013-frahm.pdf. Hogarty, Sarah Bailey, and Brinker Ferguson. 2014. “The Immersive Period Room: Historic and Contemporary Approaches to Interactive Storytelling.” MW2014: Museums and the Web 2014, January 30, 2014. http://mw2014.museumsandtheweb.com/paper/the-immersive-period-room-historic-and-contemporary-approaches-to-interactive-storytelling/. Parks, Arva. 2006. George Merrick’s Coral Gables: “Where Your ‘Castles in Spain’ Are Made Real!” Miami: Centennial Press. ———. 2015. George Merrick, Son of the South Wind: Visionary Creator of Coral Gables. Gainesville: University Press of Florida. Sierra, Albert, Gabriel de Prado, Isis Ruiz Soler, and Ferran Codina. 2017. “Virtual Reality and Archaeological Reconstruction: Be There, Back Then.” MW17: MW 2017. February 14, 2017. http://mw17.mwconf.org/paper/virtual-reality-and-archaeological-reconstruction-be-there-be-back-then-ullastret3d-and-vr-experience-in-htc-vive-and-immersive-room/. Snavely, Noah, Steven M. Seitz, and Richard Szeliski. 2006. “Photo Tourism: Exploring Image Collections in 3D.” ACM Transactions on Graphics (Proceedings of SIGGRAPH 2006). http://phototour.cs.washington.edu/Photo_Tourism.pdf. Karen Mathews is an Assistant Professor in the Department of Art and Art History at the University of Miami. She specializes in Spanish and Spanish Colonial Art, and has been conducting a research project employing 3D imaging to analyze the historical architecture of the city of Coral Gables since 2016. She is also employing photogrammetric techniques in a classroom setting, where students are creating 3D models (using photogrammetric techniques and 3D modeling software) of Spanish Colonial objects in the Lowe Art Museum at the University of Miami and designing a virtual, web-based, exhibition of the artworks. Chris Mader is the Director of Software Engineering at the University of Miami Center for Computational Science. He and his team have been working to apply new and emerging techniques in photogrammetry and image processing with a number of collaborators (including Dr. Mathews) during the past several years. These efforts include the application of low altitude aerial photography (drones) to create point clouds (3D models), orthophotos, and maps. 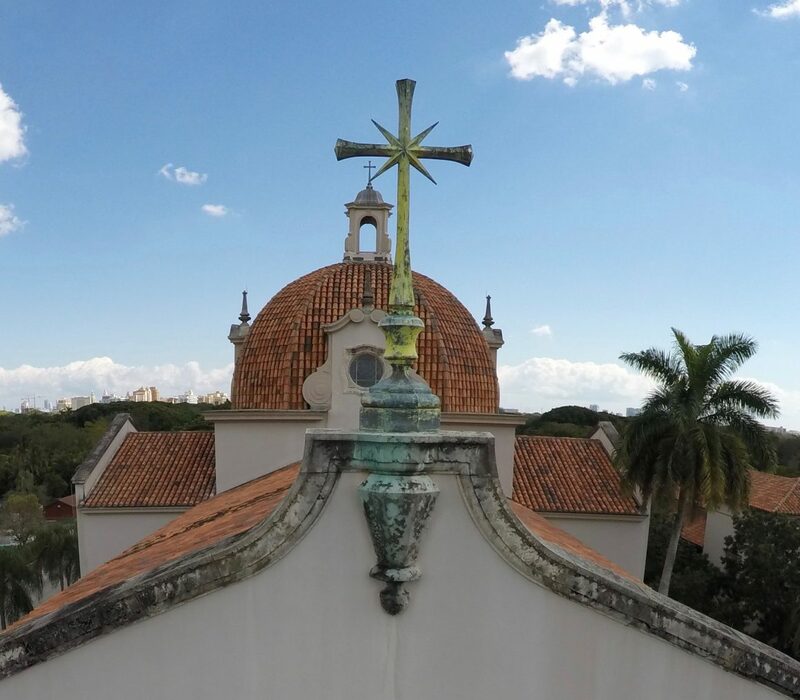 Examples include the work in Coral Gables (described in this article) as well as photogrammetry/surveying of the Iglesia de Santa Lucia (Santiago de Cuba) and “The Residency” on Harbor Island (Bahamas). Amin Sarafraz is currently an associate scientist at the University of Miami Center for Computational Science. He received his Ph.D. in civil engineering from the University of Miami in 2012 and he also holds a M.Sc. in Photogrammetry from the University of Tehran. He has been working on mapping informal cities using drone images for more than two years. Prior to joining UM, he worked on several mapping and GIS projects in Iran. His Ph.D. work involved applications of computer vision in civil engineering, including underwater imaging, image enhancement in scattering media, 3D reconstruction, and non-destructive testing.